Lisa Alexander is an artist and researcher working across the mediums of performance, writing and installation. Her works engage the subjectivity of witnessing and artistic practice as a lens on social imagination exploring modes of shared narrativity, embodied and experimental poetics that also draw on prior training in dance. In recent years projects have explored critical moments of change in Europe. If/Then was a collectively generated and collaboratively written poetic work, created with Hari Marini just prior to and following the EU referendum of 2016 presented at the National Poetry Library and Camden People’s Theatre. 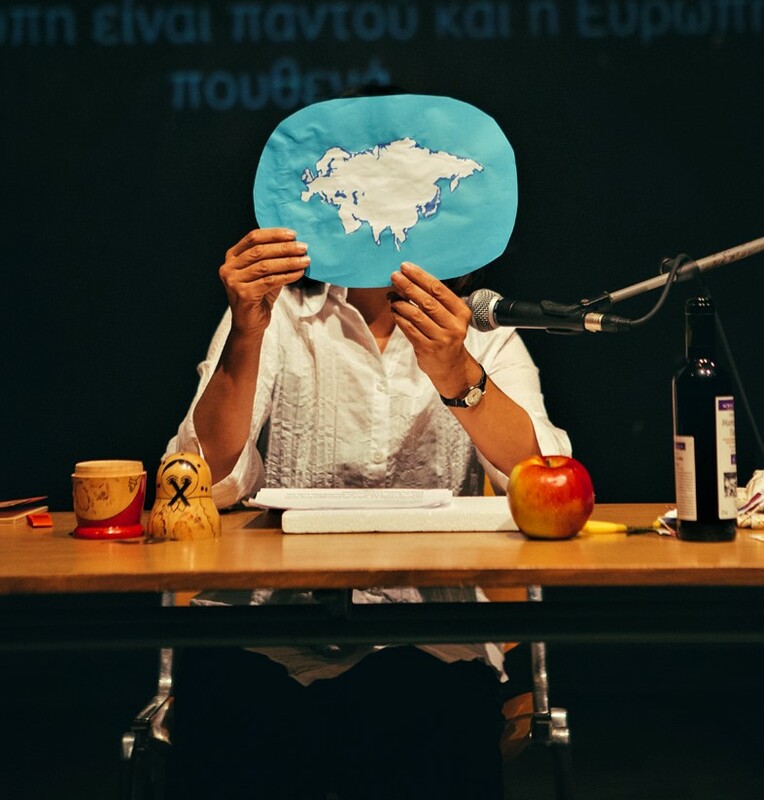 Love Letters to a (Post-)Europe at BIOS, Athens (2015) stemmed from an urge to curate a process of coming together and collective witness following the referendum on bailout measures in Greece and the growing humanitarian crisis across Europe. Lisa holds a PhD in performance and experimental poetics from Roehampton (2014). Lisa is joined by writer and artist Mary Paterson, performance artist and writer Jungmin Song and poet Saradha Soobrayen. For Who Are We? she presents Filoxenia – a durational poetry relay – realised as a single sentence crossing borders in form, content, effort and space. You are invited to take part in this collective writing action exploring provocations on hospitality, friendship, social imagination, polarisation, border-crossing, poetic agency and love – as a means to imagine together otherwise and beginning with filoxenia the Greek word for hospitality whose connotations are multiple. Xenios Zeus was the name of the controversial 2012 migrant stop and search operation in Greece, whilst it also refers to the ancient God of Hospitality, welcoming a stranger into your home, the crossing of thresholds, filo – friend and brotherly love – filea, human care and agency. Where language often plays a key role in the control and preservation of borders – poetic witness exceeds linguistic boundaries via its singular, relational and embodied address. Participants will engage in poetry games, participatory writing, reading and recording to generate a collective poetic work. This relay marks the beginning of a series of performance events and a book that builds on Love Letters to a (Post-)Europe in Athens – exploring performance, assembly and the action, idea or form of a live letter. Supported using public funding by Arts Council England.